One of the nicest, and most consistent, feelings in the world is the relief inspired by having a home that is calm, serene and a sanctuary of sorts; knowing that after a long, stressful day you can come back to a dwelling that promotes feelings of serenity. 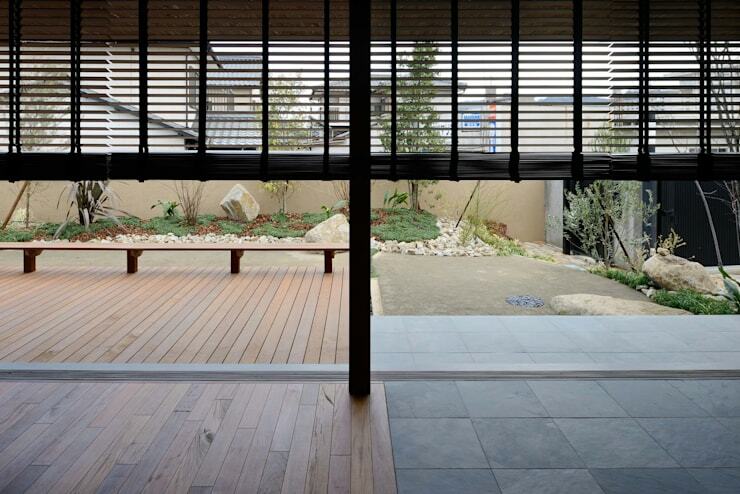 Japanese design stresses on creating a Zen-inspired space—defined by its minimalism and use of timber—but more and more we see contemporary adaptations of the concept of Zen design. A fruitful meeting of Zen principles with modern lines, one could say. The 360° project we will explore today is a home that radiates an almost-tangible sense of serenity. 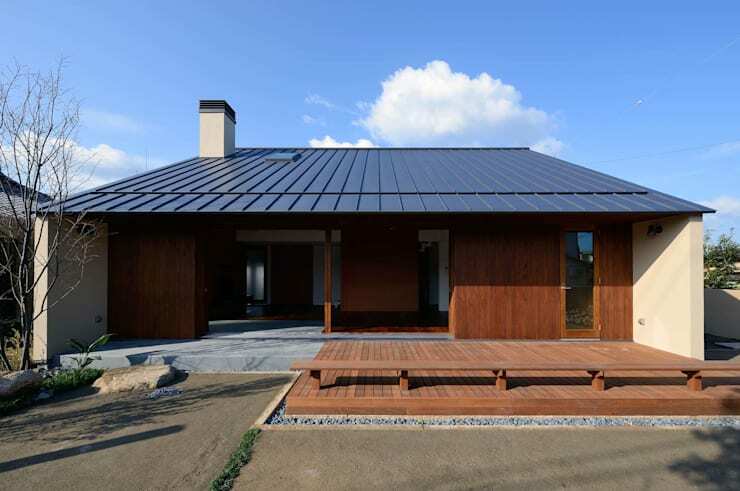 It combines the fundamentals of Japanese aesthetics with sleek modern lines and functionalities. 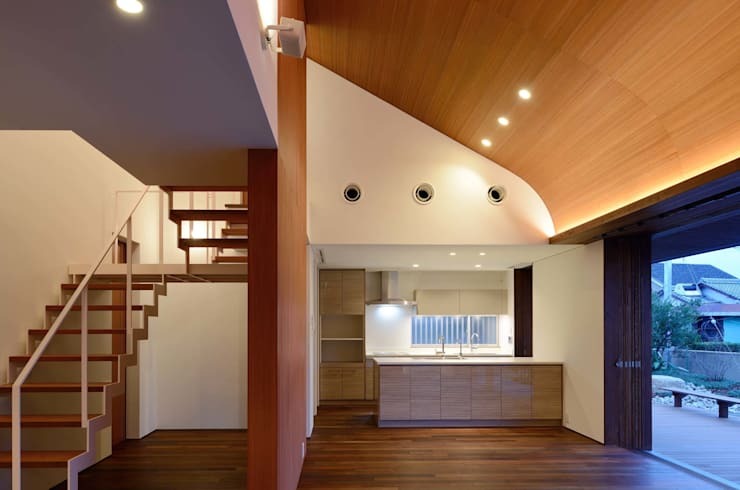 Designed by the Kyoto-based architecture firm Masahiko Sawamura, the house incorporates timber and white to create an open, balanced space that is the perfect base camp. Although simple and largely traditional, the facade instantly catches your eye with its unique architectural features. The large gabled roof provides a stark contrast to the deep wood-panelled walls, which in turn play off against the concrete patio. One half of the patio is clad in wood, and juts out onto the courtyard—visually integrating the internal area with the exterior while also doubling up as a terrace. Notice how there is plenty of room underneath the eaves, which provides shade to the house while allowing the architects to open up the front-facing portion and yet maintain the privacy of the owners. Come nightfall and the house takes on an even more unique quality; with its triangular roof and chimney, it would fit right in into a Nordic landscape! If it weren't for that contemporary Zen courtyard of course. The cobbled pathway leads up to a warmly-lit entrance, which is housed in an adjoining wing of the overall structure. A textured concrete wall on the entrance wing gives it more character while also imparting a warm yet modern finish. To find out more about Zen courtyards, speak to our experts here. The first impression you get once you step inside is that of being closer to nature, an effect undoubtedly achieved by the abundant use of woods of different grains. Minimalistic lines are the order of the day here, the impact of Japanese aesthetics on contemporary design. 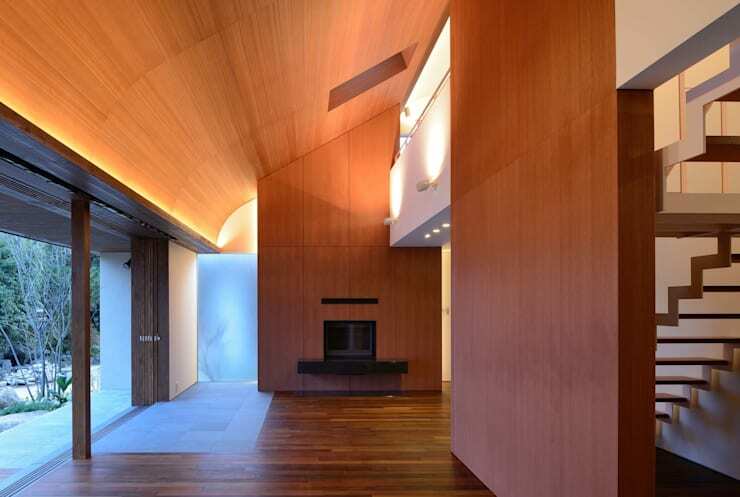 The one exception is the slightly curved in ceiling, which creates an interesting visual element. Notice how the concrete on the patio spills over into the interiors in a limited area, making the transition between outside and inside that much smoother. From here you see the ultra-minimal and modern kitchen, which is ingeniously designed underneath the eave of the roof, a space that could otherwise have been under-utilised. On the left is the rather uniquely-designed staircase that has a zig-zag appearance that is achieved thanks to the smart play between the wood and the white elements. While intensely contemporary in appearance, it is the abundance of natural light and clean, minimal lines that gives the space its Zen-inspired appeal. Natural light is a core design principle in Japanese architecture, so you will see plenty of large glass windows, open spaces that let light flow through and often, skylights or other outlets on the ceilings. It wouldn't be a Zen-inspired space if there wasn't a quiet, meditative corner where you can recharge your batteries. From here, you can see the slightly-elevated low-lying bench (seen in the first picture, from the outside) and the simple Zen courtyard. Rice paper screens have been eschewed in favour of more practical bamboo roll-up blinds. To check out more Japanese-inspired design, go to 12 beautiful Wabi-Sabi Japanese bedrooms. 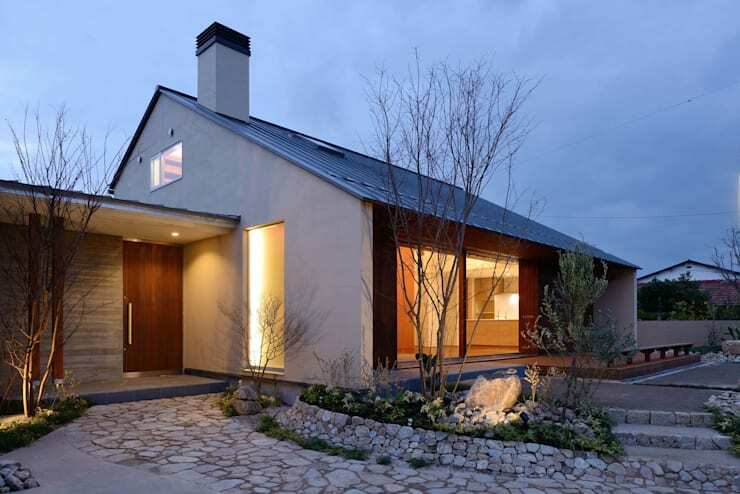 What did you think of this serene and fuss-free modern home?